Within a few years of BBC television restarting after the end of the Second World War, there were already suggestions that perhaps the Corporation's monopoly on broadcasting was restricting the type of programmes available to the British public due to the limit that public funding imposed. 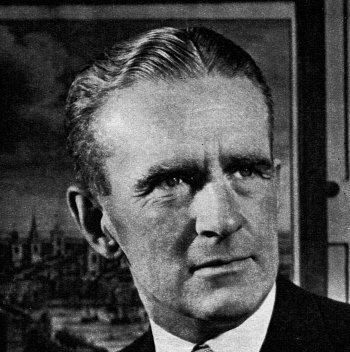 Although the Beveridge Committee, set up by the Government to report on the future of broadcasting, as well as the future of the BBC itself, came down firmly in favour of maintaining the BBC's control on what the public did and didn't see on its TV screens, opposition MP Selwyn Lloyd offered his 'Significant Minority Report' to the House of Commons, which argued that the influence on broadcasting should not be vested in any monopoly whether it be privately or publicly owned. The report went on to propose that a British organisation should be created as soon as possible, charged with the development of 'sponsored broadcasting.' However, this was in 1949 and it would be almost three years before the debate would be raised again in earnest. In December 1951 the BBC's charter was due to expire and as that time neared so questions of the BBC's monopoly were raised yet again. This time though the BBC had lost one of its closest allies because earlier that year the Labour Government under PM Clement Attlee had fallen in a General Election to the Conservatives. Amid heated debate in the House of Commons in which the Labour party strongly opposed any change of policy, the Government granted the BBC a new licence. Although there were now to be modifications in its monopoly position that would, in effect, leave the back door ajar for pressure groups to mount their campaign for commercial television. Collins' controversial decision to quit the BBC over a decision of censorship made headline news. 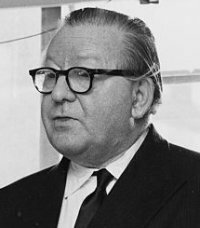 Amongst those people calling for changes in the broadcasting system were business executive Norman Collins, whose company ABDC was backed by Sir Robert Renwick, one of the heads of W. Greenwell and Co., a major city stockbroker, and C.O. Stanley who had founded the electronics company PYE. 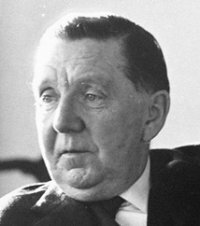 Collins in fact had been the head of the BBC when he dramatically resigned from the post in 1950 in order to devote his experience towards the setting up of commercial television. It was Collins who lit the touch-paper. Collins' controversial decision to quit the BBC over a decision of censorship made headline news. 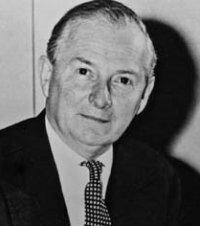 A BBC TV play called Party Matters, written by Val Gielgud poked fun at politicians and even implied (in satirical manner) that socialist MP's were taking backhanders for political favours. After transmission, Lord Simon, Chairman of the BBC, immediately called for the proposed second showing of the play to be scrapped. The Tory press roared disapprovingly at the ban and a week later Collins walked out of the BBC for the last time. Collins set up a company called the Associated Broadcasting Development Co. of which he was the Chairman. As fate would have it Collins choice of business partners, although a textbook example of how to put together a television consortium, was to cost him a far bigger place in television history. But for the meantime Collins became a constant thorn in the side of the BBC as he set about his crusade for Independent Television, a term, incidentally, that he thought up himself. Lord Simon may well have lamented a few years later (even if he got his facts wrong) that 'If we hadn't fired Collins there would be no commercial television now.' but the eventual arrival of Independent Television seemed inevitable. Public opinion too seemed to be in favour of an independent channel as indicated in a Gallup Poll conducted by the News Chronicle, a daily newspaper, which discovered that 50 per cent of television owners favoured just such a service. 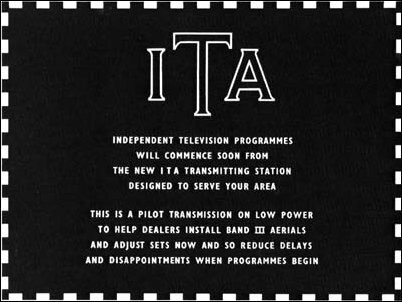 On 11 July 1952 the House debated the future of broadcasting in Britain and ordered an independent report to make, in due course, recommendations for a second channel. "As Television has a great and increasing power in influencing men's minds, the Government believes that its control should not remain in the hands of a single authority, however excellent it may be..." Thus read the White Paper issued in November 1953 explaining the Government's decision to provide commercial television. The official document took pains to point out that this was in no way a criticism of the BBC, nor should any be implied as a result of it. However, it did suggest that the BBC had held a monopoly on broadcasting to the British viewing public for too long and that lack of opposition could only make them stagnant. A second programme from the BBC would only go half way to addressing the problem and the much-needed shot in the arm could only come from competition. Few people disagreed with the report in principle. Where most people's objections came from was in the fact that the report was recommending that the alternative should be provided by commercial television. Paid for by on-screen advertising. 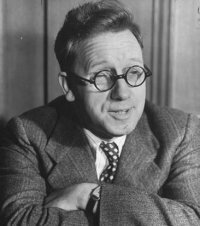 "It is utterly wrong," said MP Hugh Gaitskell, "that what we see in our homes should depend on the advertisers to make profits." It was on this and similar issues that the Television Bill was fought. In these days of multi-channel television it is hard to imagine the amount of opposition or just how much of a stormy passage the bill had in order to give the British public a second channel, whilst in the United States viewers were more than accommodated for with a wide range of choice. Its critics saw it (and therefore likened it to US TV) as nothing short of mass seduction of the innocents by the unscrupulous. They fought it fiercely as debates were raised, not only in Parliament, but also in university lecture halls, community social halls and even working men's clubs up and down the country. And the objectors very nearly got their own way when at one stage the Bill came within six votes of defeat. By the time the Bill had reached its committee stage no fewer than 137 amendments were tabled. The then Assistant Postmaster-General, L.D. Gammans put his case for the Bill: "If we can trust the people of this country to go on a jury, to give them freedom to buy a newspaper, or the right to vote and decide the destiny of their country, then I think they can be trusted to look at a little picture on their television screens." MP Ness Edwards, arguing vehemently against the Bill did not think so: "Does the Government really think that the serious side of television will get a chance if it has to depend on what is paid for by the frivolous side? Do they really think that education, religion and subjects of social importance will be supported by beer, pools and pills?" And so the row went back and forth, fuelled by a rise in the TV Licence of £1.00 made partly to finance the new venture. MP Hebert Morrison, speaking from the opposition benches stormed over the latest outrage, "Why should I, as an ordinary citizen who does not want commercial television, be forced to contribute to the subsidising of it?" By the time the Bill had reached its committee stage no fewer than 137 amendments were tabled. Even a number of its supporters were not confident in it passing Parliament and expected the whole Bill to be scrapped. Herbert Morrison claimed that the Bill was such a muddled affair that it had obviously been thought up by twenty or thirty Government back benchers who had "rattled a weak-kneed Government into accepting it." But his amendment, along with the other 136, was rejected and after three months of delays in which the row grew to mammoth proportions and arguments became less evenly tempered, the Bill passed its third reading in the House of Lords. On 30 July 1954, it received Royal Assent and became law.